Is sleep affected by the phase of the moon? An analysis of several years of 4 Zeo users' sleep data shows no lunar cycle. I attempt to replicate, using public Zeo-recorded sleep datasets, a finding of a monthly circadian rhythm affecting sleep in a small sleep lab. I find only small non-statistically-significant correlations, despite being well-powered. This interested me both because of the novelty of the claim and because if lunar phase has an impact on sleep, then adding it as a covariate could increase the power of my sleep analyses by reducing error (and best of all, could be calculated for any date - without requiring data I did not collect at the time). So I looked into it further. Reading the paper, I didn’t find it convincing. It’s a small sample size (~64 nights across 33 people), there’s a ton of measured variables they could look at for responses, some of the analysis choices are questionable (like how they binned phase of moon: why discretize it when the easy approach is to use some astronomical library to get an exact percentage visible? They never justify their “three lunar classes”), they show the scatterplot of only one of their variables which isn’t terribly impressive, there’s many possible covariates like gender & age, it’s a post-hoc analysis they admit they thought up one night (so how many other analyses did they run and not publish…? ), the data is very old which makes me wonder why now & where is the rest of the data from their sleep lab, and (as they say) the priors are against there being any effect since previous research has generally failed. As far as replications go, Eric Jains found no lunar correlation in his BodyMedia FIT data after including weather data. Fortunately, I have been using a Zeo since 2010, so I can attempt a replication myself. While I don’t have salivary melatonin or cortisol levels or raw EEGs, I do have all the summary metrics from my Zeo, which my latest export in January 2014 gives me ~1050 days of data (~16x more nights, all from one subject with the reduced variability but also reduced external validity that implies). The analysis is easy enough, and I can even improve on their analysis by using a better phase variable than their arbitrary trichotomy; my life is not as well controlled as a sleep laboratory but here I have the advantage of no sleep disturbance from the laboratory or equipment an in any case, because I would be exposed to lunar cues like the full moon, we would expect the error here to be finding a relationship where there is not one due to circadian rhythms. 3 other Zeo users kindly offered me their Zeo data, giving me a total of 2431 nights of data. 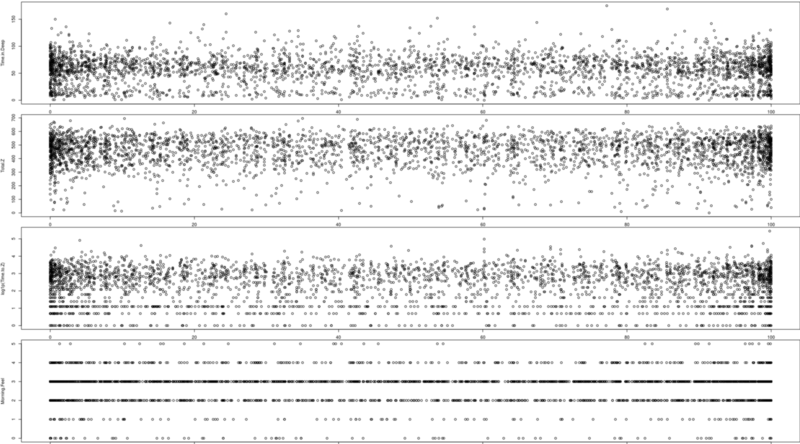 Hopefully with >28x more nights of data, I can find their lunar correlations - if they are real. # "Percentage of bright area visible from Earth"
Walking through a bunch of statistical tests doesn’t turn up much of anything either; throwing the kitchen sink at the data, there’s a correlation of lunar brightness with total sleep time but it doesn’t reach p<0.05. 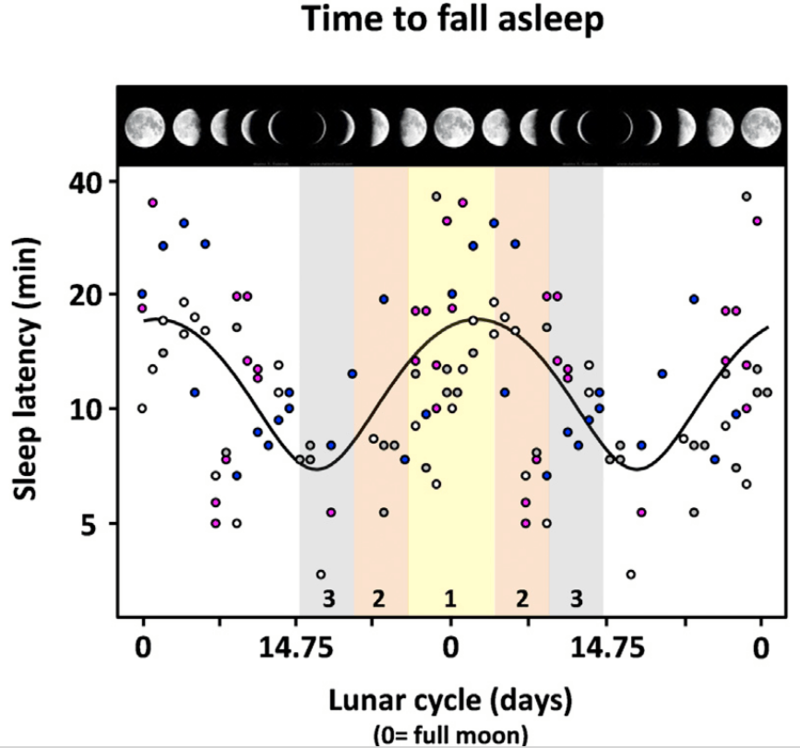 No outcome seems associated with lunar phase, and neither sleep duration nor sleep latency have any sinusoidal relationship with lunar phase. l4 comes closest, but the simplest model l1 is still the best: a fixed effect for Phase, and subject-specific intercepts. So, subject variability does not seem to be masking any lunar effect. A final consideration: was the sample size large enough to detect the correlations that Cajochen et al 2013 found? For example, Total.Z seemed to come near statistical-significance, could it be that with more data, we would reach the same conclusion? # how often did the linear model produce _p_<0.05? At 93% power, sample size is not an issue.